Home > 2012 > April > 19 > How Not To Starve As A Starving Artist 2: Who are your customers and where are they hiding? How Not To Starve As A Starving Artist 2: Who are your customers and where are they hiding? This post elaborates on and explains this concept. We use 4 basic questions to narrow down our target audience and where to find them. This helps us determine which shows to attend, target our marketing efforts, and decide what sort of ancillary products to create. Who seems the most interested in your work? What events does each group attend? Where are the biggest overlaps? 1. Who seems the most interested in your work? This is the most critical and basic concept to grasp. While you may have fans of all types, there will usually be a few groups of people who share certain characteristics. There is no point in trying to be everything to everyone. Not everyone is going to be interested in your art; taste varies widely. When you try to appeal to everyone, your work usually ends up either bland or disjointed. Focus on what is most important to you as an artist and let the audience come as it may. Keep track of who buys your work, or who makes a beeline for and/or lingers at your table. Note similarities and try to come up with a list of a few basic groups. For example, our work attracts the following groups of people: art collectors, Fantasy/Sci-Fi fans, women & children. We produce attractive art with a good amount of technical skill, in Fantasy/Sci-Fi genres, with non-exploitative female characters, and our work is appealing and accessible to a younger crowd. Obviously some groups overlap, and we have some fans who don’t necessarily fit neatly into a particular category. However-those that don’t fit those categories are willing to purchase art that isn’t seen as “manly”, for example. There’s no point in making my art less pretty to try and draw more men to my work-it shows when your heart isn’t in it, and you risk losing the audience you already have. (I’m not talking about natural evolution in your art, I’m talking about faking it to pursue a market.) It’s better to focus on doing what I do well, and finding ways to get my work in front of my audience. 2. What events does each group attend? Another critical concept-knowing this will save a lot of stress, aggravation and money. Most conventions collect demographic information, and requesting this is a great way to evaluate conventions you’ve never attended. You can also do background research using sites like Facebook, etc, to see what types of people attend the show. There’s little point in going to an event that has a low attendance in most of your key demographics, unless tables are cheap or free. For example, we no longer attend Chicago Comicon, as we could not justify the expense in terms of exposure and sales. It’s not our crowd, and the money’s better spent elsewhere. We used to do well at Comicfest when it was still around, but it was inexpensive, making it easy to do a good profit in “girlfriend” sales. Our fans are primarily at anime/fantasy/gaming cons. We’re planning to test the waters at some local craft fairs soon, to see how well we can do there. Do some research on shows you might attend-first rank in order of financial feasibility (no point in trying for a con where you simply can’t afford travel, etc) and then filter that list by demographics. Come up with at least one show for each target group. 3. Where are the biggest overlaps? Using your groups from the first question and your list of shows from the second, figure out which conventions have the largest amount of attendees in your target audience. We try to hit cons where at least 40-50% of the attendance is female. That’s the easiest of our demographics to quantify. Also, conventions that are women friendly tend to be child friendly as well. So that’s 2 groups we can count on at a convention like Animecentral. We try to attend conventions where our genre is welcome-either general interest cons that include the genre or specialty cons. It wouldn’t be worth our while to go to a horror convention, for example. Again, Animecentral is a good example of a place where another of our demographic groups-Fantasy/Sci-Fi fans- can be found. Also, we try to attend conventions where there will be a reasonable amount of art collectors attending. This is the hardest group to quantify. The best indicator for this is art show rules. If the rules limit or exclude prints and otherwise privilege original art, or there is a well attended live auction, it’s likely that there are customers attending who are art aficionados. 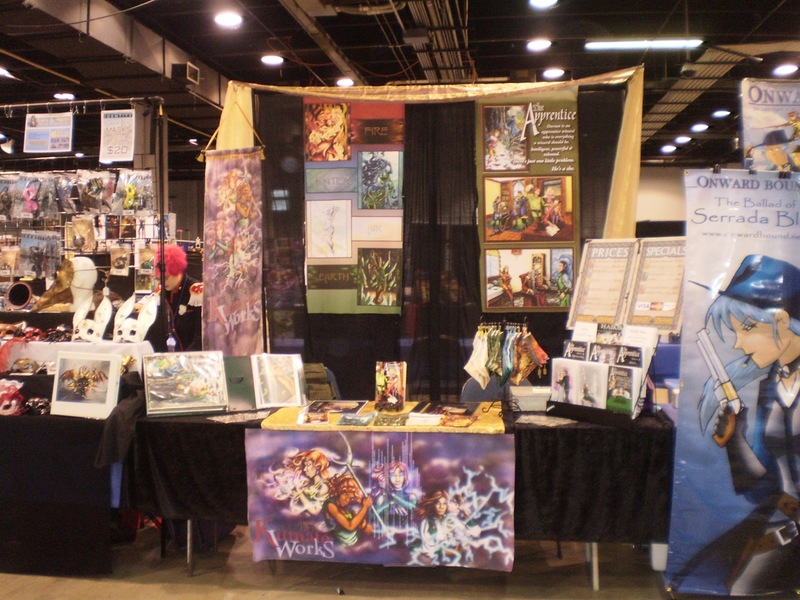 Animecentral is middling for art aficionados-there’s a reasonable market in the art show there, but it’s not the spectacular prices that you see at some fantasy cons. By now you should have a short list of conventions that are likely to have attendees who would be interested in your work, which you can rank in order of cost to yourself and general feasibility in terms of travel, etc. 4. Where do you have the least amount of competition? This is the last consideration, but it is important. This requires that you take a serious look at your work and evaluate your level of skill, your costs, and how you compare to other artists doing comparable work. You also need to take a hard look at who attends the alley and how they compare to you. There will always be competition in the Alley, and generally it’s healthy and good for everyone. However, there are two situations that are deadly to both morale and cashbox. The first example is one that you can normally correct on the spot, but it may bruise your ego a bit. It can be really hard, especially when you are emotionally committed to your work, to admit that your neighbor is just flat out a better artist and thus your work won’t sell next to that person if it’s the same price. Sometimes, you just have to bite the bullet and lower your price if possible, allowing you to make up on volume what you can’t in price. (That’s one of the reasons we advised higher markups in the last article.) Or you can offer sales or specials to make your items a better deal. When we first did the HNTSAASA panel, we mentioned a situation we had noticed in the alley at that con (names not mentioned, of course.) A beginner artist had been seated next to one of the best artists on the circuit at the time. Both were doing commissions; the advanced artist was doing color commissions on cardstock, the beginner was working in pen on computer paper. They were charging about the same price. Obviously, the advanced artist was doing much better. After the panel, we noticed that the beginner, who had attended the panel, had lowered her prices considerably and was doing a brisk business in quick commissions. Price correcting works, so don’t get discouraged if you have a bad first day. Sometimes people want what you’re selling, just at a different price. If you pay attention, you will be able to get a better idea how to price items in the future. Sometimes you may not have the leeway to price correct; you may be making craft items that have a fixed cost that you can’t lower much. That’s where the research comes in-you’ll know where you stand in terms of competition, and can evaluate where you’ll do best and ways to distinguish yourself from others. It can also help as a reality check as to whether your products are ready for prime time. Sometimes you’re honestly better off staying home for a year and making your work better, rather than rushing a comic to completion, for example. It’s not a race. If your work is good, it will stand on its own merits. The other bad competition is to be sitting in a row of artists who do similar work, charge similar prices, and are at about the same level of skill. This is brutal and can turn a con that by all rights should be a great one into a nightmare. Potential customer A walks into the alley. She’s budgeted $40 to spend there. She really likes faeries, and this con is all about faeries. There are 8 artists in your row, all have faerie art, and they’re all pretty good. She likes everyone’s work, and she really wants to support the artists. So, she buys one $5 item from everyone. Repeat this 4 or five times, and while you’ve made sales, you’re barely covering dinner. You might make better sales for a bit by slashing prices, but then everyone else gets the idea and you’re all screwed. Everyone will start thinking the low prices are the norm and the infection slowly spreads to other conventions, and customers start expecting insanely low prices and freebies everywhere. What’s happened is that you’ve been turned into a commodity. You and your fellow artists are no longer being treated as skilled artisans making a valued and unique product, you are line cooks at a fast food joint. Prices get forced lower and lower until it is no longer feasible to work-nobody wins. Going for the lowest cost may work for widgets, but when you’re dealing with work that requires skill and time, there is a wall you hit where costs can no longer be lowered without killing the producer. If you minimize undercutting, you protect everyone’s ability to continue working. It’s far better for artists to differentiate on quality than price. Hence, you should try to avoid situations like this when possible, or come up with something you can sell at that particular con that stands out. Add an unusual item, or package/embellish your work in some way that sets it apart. This is especially for important for items like plushies, chibis, keychains and other easy to mass-produce/inexpensive items. It may seem like good business to jump on the bandwagon and make your own version of those chibi keychains that you noticed were so popular last year, but you’re only saturating the market when you do this and actively putting yourself into competition with others. Every artist is unique so focus on what is different about you. We attend mostly anime cons-they are friendly to our demographics, but my style is anime-influenced rather than being strictly anime. We stand out in the crowd while still being within at least the ancillary interests of many attendees. There aren’t too many artists at the con with similar work so anyone looking for more complex traditional media art is choosing between about 5 artists rather than 50 as they might at a traditional fantasy con. At a fantasy con, we’re much more of a commodity and more likely to get lost in the crowd. Those are the basics of how we choose conventions to attend. It’s useful as a strategy to winnow down a large list of conventions. There are always exceptions-as I said earlier, if a convention is very inexpensive, we may still attend. At comic book conventions, for example, we often make good sales by catering to girlfriends and family members who attend with members of the core demographics. 😉 In those cases we function as an oasis for folks who feel a bit disconnected from the environment, so we’ve gotten many sales just from being the only place a girl felt welcome, for example. This trick only works if the table is cheap. We do listen to scuttlebutt about cons, but I will be honest that while gossip is useful in finding out if a convention is run badly, it’s largely been useless in gauging potential sales. Art is such an individual taste that two artists of equal quality can have entirely different convention experiences. Research and paying attention to your particular situation is the best way to determine which cons are best for you.